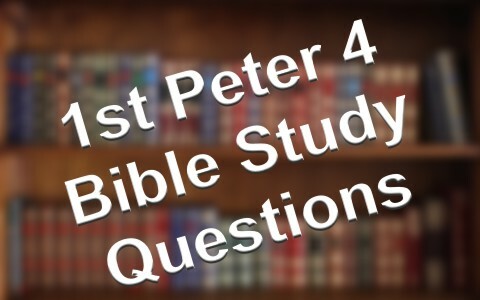 What type of Bible study and questions could we glean from the Book of First Peter chapter 4? What ones would you suggest? The Book of 1st Peter is a book for the ages. There is never going to be a time when the Word of God is not helpful and beneficial in the Christian’s walk with Christ. Peter endured beatings and imprisonment before finally being crucified, as tradition holds, upside down but Christianity could be said to have been turning the world upside down too…perhaps we could say right side up! Read along with us in 1st Peter chapter 4 to see what type of Bible study and questions we can come up with that you, your small group or Sunday school could use. How this is relevant to believers today? Who does this apply too? Why should we consider this chapter as meaningful to us? When can we use these truths for today? Where is it applicable to us? Where are there similarities in our life? What are we to learn from it? I suggest you could use these questions for each verse and if you are in a small group or study, leave time for the participants to answer these questions. If you are studying this for yourself, write out your answers after each verse to see how you can take these verses to heart to grow in your faith. If Christ suffered in the flesh, should we not expect the same, although certainly not to the same extent? What is Peter saying we should “arm” ourselves with? What does he mean by saying that “whoever has suffered in the flesh has ceased from sin?” How can we replace our human passion or living in the flesh for the will of God? I do know that anyone that wants to be Christ-like must suffer like Christ did, but again, not to the same degree. How many of us remember living in these lusts of the flesh? How many of us were attending drinking parties, getting drunk (or had substance abuse problems), living in sexual immorality, idolatry (of lust, money, greed, and so on), and letting our passions be our guide? What has changed? Why did it change? Have you experienced persecution from those you used to run with in doing such sinful things? Why are they surprised that you don’t join them in such sinful desires of the flesh anymore? How do they “malign you?” What does it mean that they will all have to “give account to him who is ready to judge the living and the dead?” Who are the living and the dead? Is it those who have already died or those who are living but in reality dead in trespasses and sins? The Gospel is Preached to the Dead? What does Peter mean by saying that “love covers a multitude of sins?” Was he talking about Jesus death for us? Did he mean that our earnest love for one another covers these sins? Did he mean that the sins to be covered were those against us or those we should cover or keep secret from others and the church? Why does Peter tie in showing hospitality to not grumbling? What is the connection between the two? What are the “oracles of God” that Peter wrote about? Are the oracles of God the Scriptures? Were they the Old Testament Scriptures? Was Peter talking about the oracles of God being Paul’s writings, the gospels or his own letters to the church? How can we “serve by the strength that God supplies?” What does that mean? How can serving through the strength that God gives glorify God? Why should we not be surprised when we experience trials? Does this mean that the only surprise would be if we never did experience them? Why shouldn’t it be strange that we’re undergoing trials? How can we rejoice in persecutions? Why should we? How is God’s glory revealed in our sufferings? How was God’s glory revealed in Christ’s sufferings? How is it possible to receive a blessing for being insulted for Christ’s sake? What kind of blessing would it be? What is “the Spirit of glory and of God” that rests upon us? What is this “Spirit of glory?” Is it God’s Holy Spirit? Why would Peter be writing to Christians to not suffer as a murderer, a thief, an evildoer or a meddler? Why would Peter be telling believers this when they are like not murdering anyone? Was he speaking about the reference to when Jesus said that hating someone is like murdering them in the heart? Why are we not supposed to be “ashamed” but instead, glorify God in suffering? What does Peter mean that judgment begins at the household of God? What kind of judgment is this since Christians are supposed to have all of their sins already judged at the cross? Is this talking about church discipline? What does it mean to “suffer according to God’s will?” Is it really God’s will to suffer? It is my hope that you can benefit from this rich text that is found in 1st Peter 4 and that you can grow in your Christian faith in a way that is pleasing to God. Perhaps it will prepare you for the times ahead of us when Christians will suffer more and undergo more and more persecution as the time of Christ’s return draws near. ….arm yourselves with the same way of thinking…when you arm yourself, you protect yourself as in going into battle..and as a Christian…you are to wear the helmet of Salvation which is our Lord’s One and Only sacrifice on the cross for the forgiveness of ALL sins…in doing so…we have nailed our sins on the cross with our Lord…to which we will receive Him in our hearts as He, the Spirit of Truth will live in that man’s temple, made clean by Faith in the Word of God, His testimony…His Only beloved son given…so that those who believed in Him will be saved, sin ceased to exist in that man because He is with His Son and therefore is also with the Holy Father, who is in the Son. Well said Marlon my friend. Thank you so much for contributing to the content of this article. May God richly bless you for that. I am a former catholic and am now a born again in Water and in Spirit, Christian. When a person has truly experienced the Saving Grace of God, he understands that we are in a journey back to God, after He has freed us from the slavery of sin and the chains of death….we are now moving forward and not looking back at the life of sin…this is the same as when Lot and Family were coming out of Sodom…the life of lust and of flesh is gone…the TRUTH is revealed…we are children of God in the Name of Jesus Christ…. Amen…congratulations my dear friend in Christ. It is a joy to have you visit our website. Love your ending where you wrote “the One who walks above waters.” Amen and amen! Love that. Our pleasure my friend in Christ. Thank you as well and I thank God for you. The whole earth, dead as it is for being apart from God because of sin, has received Mercy through our Lord Jesus Christ, the Lamb of God…that all of us who are dead because of our sins…have received HOPE…that we may inherit our Lord’s promise of Life through His Only Begotten Son…which is what 1 John 5:11-12 – And the testimony is this, that God has given us eternal life, and this life is in His Son. He who has the Son has the life; he who does not have the Son of God does not have the life. Our Lord is Spirit and that is why we all have to worship in Spirit, but because we are still with the flesh we are still subject to the desires of the flesh…but through the Strength of God’s Love, we will always be aware and mindful about the PRICE paid for our slavery…and the Promise that we will be with the Lord, where He is…and that is with the Holy Father in heaven. We must constantly guard this gift that we may not loose it and exchange it for temporary things….and whatever is temporary…it always end….and there is only One who is Forever and that is God…. 1) Born again in Water(and why you capitalize the word “water”. 3) Who is forgiving sins in your statement above(God or man)? 4) What does the Promise of Life entail…and why would a person who has their sins forgiven (by God) not be born again and not partake in the Promise of life? It is important that when we read these terms being used by others that we understand how the speaker defines them. My suspicion is that we differ greatly in these definitions which is very important to determine before we can have a coherent discussion. 1. The “Water” to which we are to be baptized in is Faith in the Word of God. Read Ephesians 5:26 – …to make her holy, cleansing her by the washing with water through the word….read John 15:3-4 -“You are already clean because of the word which I have spoken to you. 2. Born Again in Spirit…Read 1 Peter 1:23 – for you have been born again not of seed which is perishable but imperishable, that is, THROUGH THE LIVING AND ENDURING WORD OF GOD. 4. Go read Matthew 18:25-32 again….was not the slave forgiven of His sin? How? was it after he pleaded for forgiveness?..or without pleading for forgiveness?…. It is in believing that you understand…for the Spirit of Truth will reveal Himself to a believing man’s…..
Old testament saints believed the prophecy of the messiah to come and we believe the history of the messiah’s birth, life, teachings and death on the cross. They looked forward and we look back. Those who were there… well thats kind of self explainatory. They either trusted or triviallized HIS life. Now my question is, which era do you think had the most difficult time trusting and believing, our forefathers from the past looking forward, those present during HIS life or us now looking back from the “future”? Peace and Grace of our Lord Jesus Christ, be with you and all those entrusted to you. Here Jesus contrasts physical and spiritual birth. Note the authors do not capitalize “water”. Water is what the child comes through in physical birth. That is what Jesus refers to in vs 6 as “that which is born of the flesh is flesh”…that is the first birth necessary for salvation. The second birth is spiritual which is necessary for salvation. “and that which is born of the Spirit is spirit. The Spirit is what one comes into in spiritual birth. It was a beautiful contrast/compare by the Master of metaphors. “unless one is born of water AND the Spirit, he cannot enter the kingdom of God”(vs 5). We are saved by Grace, not Scripture, through Faith in Jesus(Eph 2:8,9). Grace/Belief causes an independent act of the Father to occur…the Holy Spirit tabernacles with us. This is the second birth. “Don’t you realize that your body is the temple of the Holy Spirit, who lives in you and was given to you by God?”(1 Cor 6:19) We are not born of Scripture, we are born of flesh AND His Spirit. Forgiveness is available to all men(Jn 3:16) but all men aren’t automatically forgiven by Calvary. To believe that they are, runs into many Scriptural problems. The provision for forgiveness(Calvary) does not impute forgiveness without belief. I know we might be moving into a much broader discussion of unlimited vs limited atonement. I understand your quote if you subscribe to the former. From your previous remarks I believe you are of the latter camp though, hence my confusion with your statement. So I ask again, how can one be forgiven by God of their sins(breaking the Ten Commandments), when they have not believed in Christ, according to what you wrote in that quote three paragraphs above. (Perhaps I am not understanding the meaning of your quote above, as you switch verb tenses within the quote). DocReit, do you believe Mosses is forgiven his sin?….do you believe king David is forgiven his sin?…. They were looking forward to Calvary, just as we look back at the same. OT saints had faith in the Father’s coming Messiah. It is through faith that OT saints were justified just as through faith we are saved. It is not “by” faith that we are saved, it is “through” faith(Eph 2:8,9). We are saved, OT and NT saints alike only by God’s Grace as we exercise our faith and trust in Him. Marlon, do you believe everyone(all humanity) is forgiven of their sins after Calvary? From what you have written, I would guess the answer is “yes”. I was raised Roman Catholic as you(myself by the Dominican nuns, with high school and college by the Jesuits) and understand this position. Before I reply to that idea, I would like to know if I am correct….yes or no will suffice. Peace and Grace of our Lord Jesus Christ, be with you. Sorry for the delay, I was so busy these past few days…. read Acts 10:43 – All the prophets testify about him that EVERYONE WHO BELIEVES IN HIM RECEIVES FORGIVENESS OF SINS through his name.” ..
DocReit, the Spirit of the Lord in my heart says, One has to BELIEVE to be FORGIVEN….though our Lord has died on the Cross for all sins…it does not give forgiveness unless one believes….those who have died but have believed in the WORD of GOD and has KEPT His commandments/His Word…has also gained forgiveness through the Lord’s One and Only Sacrifice on the Cross, because they have believed in the WORD of God…for the Scriptures have spoken about our Lord Jesus Christ…. read 1 Timothy 6:12 – Fight the good fight of faith; take hold of the eternal life to which you were called, and you made the good confession in the presence of many witnesses. read Revelation 19:13 – He is clothed with a robe dipped in blood, and His name is called The Word of God. Thank you for your Scripture quotes and explanations. It is apparent that English is not your first language. As a result, I have misunderstood your statements. My apologies. Let me try, one last time, with why your statement below is incorrect. That is what you wrote. That is what you wrote. That is incorrect and the opposite of your other statements. Hence, I finally realized you simply misspoke. Hey, I admire folks like you who can write in more than one language. Congratulations. Btw, I never make a point about proclaiming myself to be humble, because as soon as I do, I am not. yes, without Faith in the Word and in the Truth….one cannot avail of the payment for sin….it is total rejection of Salvation…this is the is the UNFORGIVEN SIN…. DocReit…being humble is not bringing yourself up…it is about saying you are NOTHING in comparison to God’s Grace…saved by Grace not by anything of our own deed…for we are all BOND SLAVES….we are owned and paid for, by our Lord Jesus Christ…. Hi DocReits, may God’s Word, the Living Water in a believing man’s heart be with you and all those entrusted to you. Let us proclaim the TRUTH and continue to WALK IN the Light…that our brothers and sisters who are still asleep, may hear and wake up with the Words of Life…. Found favor in GOD our FATHER in the old testament? In the body of John the baptist for perpetuation of his sins. MAY the Lord GOD keep you and bless you both. Thank you Mr. Broome. Then were are these Old Testament saints today my friend? Where were they before Calvary? Gal 3:6 “So also Abraham “believed God, and it was credited to him as righteousness” and “For what does the Scripture say? “Abraham believed God, and it was counted to him as righteousness.” (Rom 4:3). You are being peaceful and thank you but what is the fate or state of these saint of old till Calvary? What about after the cross? You are correct that the only way to be saved is by grace through faith in Jesus. His work on Calvary opened heaven’s gates which were closed for all men before Calvary. OT saints waited in Sheol or Hades after they died….a place of comfort(Abraham’s bosom) awaiting the gates of heaven to be opened at Calvary. Peace and Grace of our Lord Jesus Christ be with you and all those entrusted to you. A man who has come to believe in the Truth will die in Flesh with the Lord on the Cross and will Ressurect with the Spirit of Truth in his heart…the advocate given by the Holy Father in heaven, to all who believes in His Only Begotten Son, the Lamb for the forgiveness of sins…we become partakers and part of our Lord’s Body….cleansed by His One and Only sacrifice on the cross for all sins…. The faithful servants/laborers who prepared the way of the Lord Jesus Christ…in Faith with the Words of God….are also paid with the same Grace in Jesus Christ our Lord…. read Revelation 6- 11…When the Lamb broke the fifth seal, I saw underneath the altar the souls of those who had been slain because of the word of God, and because of the testimony which they had maintained;…And there was given to each of them a white robe; and they were told that they should rest for a little while longer, until the number of their fellow servants and their brethren who were to be killed even as they had been, would be completed also.